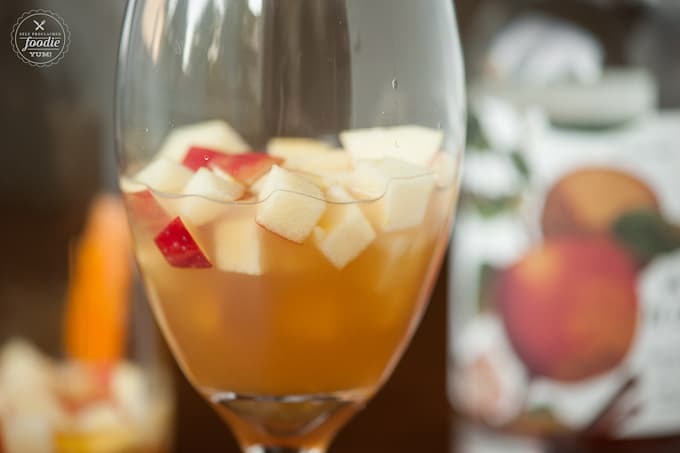 My easy, delicious, and perfect for fall Honeycrisp Sangria is made with the most incredible locally produced apple cinnamon infused vodka and hard cider. There are only two kinds of apples in this world: Pink Lady, which is available in the spring, and Honeycrisp, which fill the farmers markets here in the Pacific Northwest starting in August. My love affair with the honeycrisp apple has to do with the fact that they are large, crisp, juicy, and a perfect balance of sweet and tart. Their flesh is white and doesn’t brown easily. They’re what I use to make my no sugar vanilla bean apple sauce and my apple compote cheesecake. They are wonderful. So wonderful, in fact, that I wouldn’t dare combine them with any products that weren’t extremely high quality. 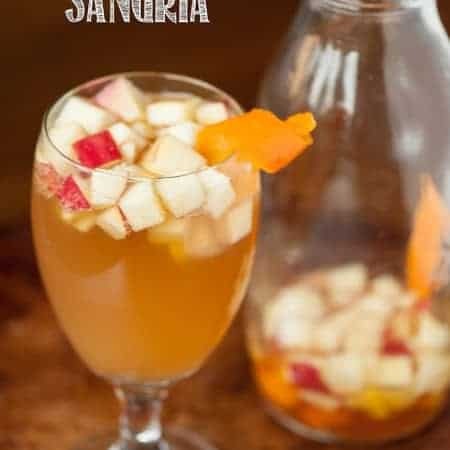 I made this undeniably delicious honeycrisp sangria with the help of two awesome companions, both locally produced and distributed right here in Portland, Oregon. The first is Wild Roots Apple & Cinnamon Infused Vodka. I first tasted the berry varieties of Wild Roots vodka at the farmers market a couple years ago and was blown away by the taste and quality. Since then, I’ve made countless tasty cocktails with their vodka. 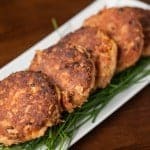 You definitely need to try them if you haven’t yet already. 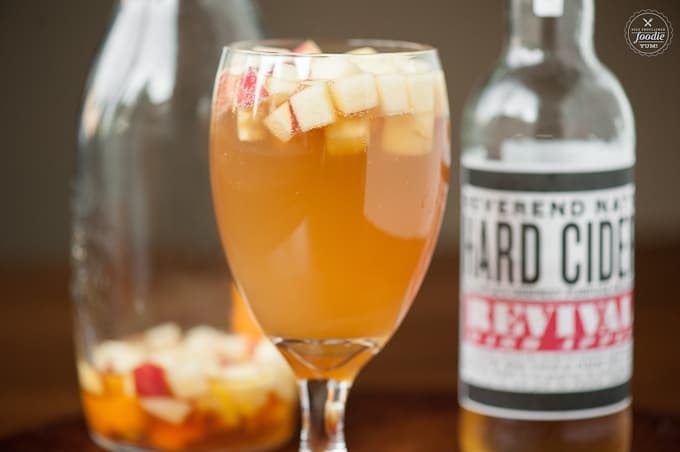 Second, I tried Reverend Nat’s Hard Cider. Since I’m not a beer drinker, I have a special place in my heart for hard cider. I actually found this cider at Trader Joe’s and they told me it was produced right here in town and was the best hard cider I’d ever taste. Like usual, they were right. I tortured my poor husband for about a week because I had it in the refrigerator but wouldn’t let him crack it open until I made this drink. 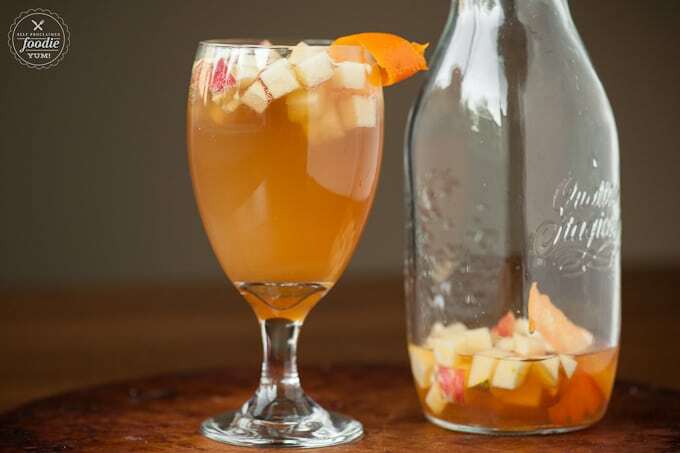 This lovely cocktail starts by soaking that beautiful chopped honeycrisp apple in the vodka along with some orange peel. 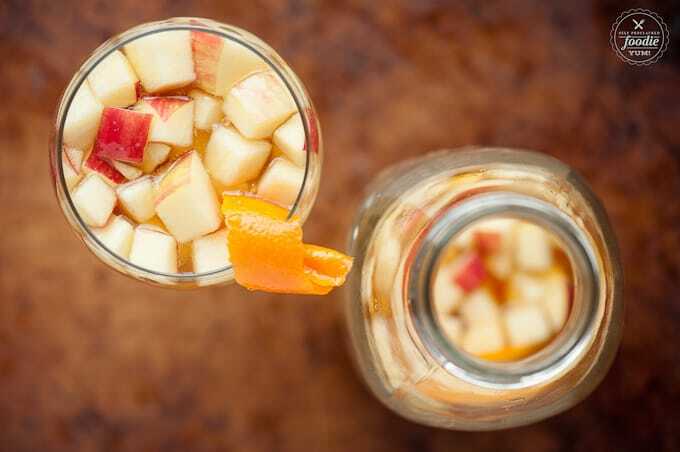 Now, if you’re in a hurry, you can let the apple swim for as little as 15 minutes, but I’m a big fan of letting the fruit really absorb all of that vodka goodness, so I prefer to let them soak in their chilled bath for at least a few hours or even over night. When you’re ready to serve your cocktail, you add your simple syrup, lemon juice, and apple cider (I use honeycrisp cider, of course) to your apple vodka mixture. Then, you divide the apples and the liquid between two glasses. Finally, you fill the glass with the hard cider. 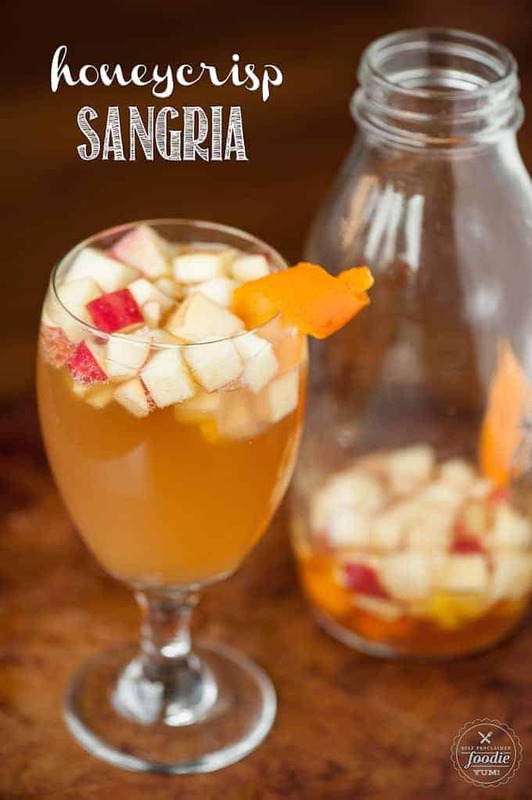 Garnish with an orange peel twist and enjoy! 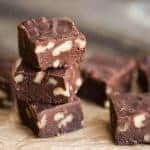 Of course, although this recipe is only for two servings, there’s nothing stopping you from making this for a crowd. If you need help with the math, just let me know. Your job is just to make sure you have all the right ingredients on hand. Enjoy! 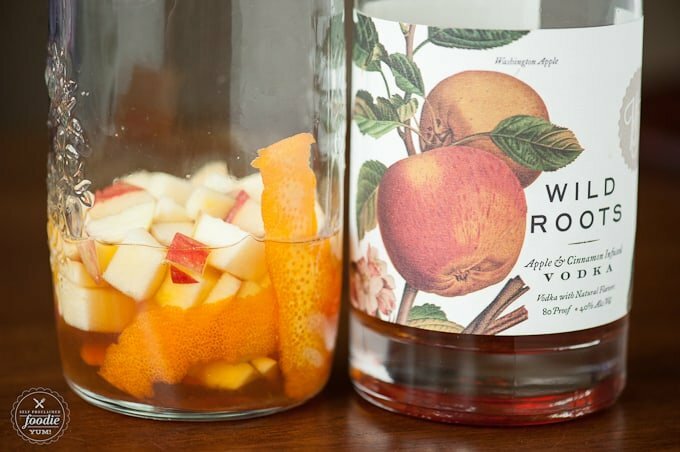 In a small bowl or glass, combine vodka and cut apples with orange peel. 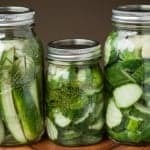 Let steep for a minimum of 15 minutes or up to 24 hours in the refrigerator (longer is better). When ready to serve, add simple syrup, lemon juice, and apple cider. Stir well to combine. Spoon steeped fruit into two glasses and divide remaining liquid evenly between the two glasses as well. Discard the orange peel. 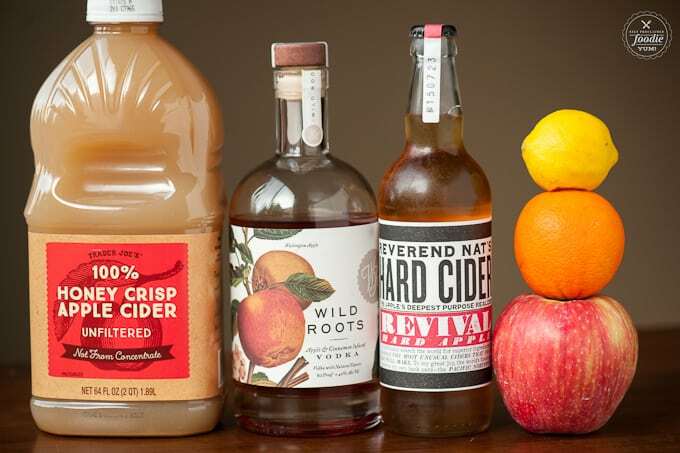 Top each glass with hard cider. 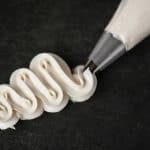 Garnish with fresh orange peel or a cinnamon stick. Enjoy!